As I sit here and begin writing this morning, I realize just how much things have changed since I began blogging several years ago. What began as early morning conversations between you all and myself regarding what the plans were for my day and what the previous day had brought to me has now evolved into something a bit different. In those early days of writing, I was striving to be successful and prove that success not only to others but mainly to myself. I had started writing at a time when my business was just beginning to build up steam and I was dedicated to making my mark in the creative world. It was before my partner Keith even joined me. It seems so long ago. The fact that things have changed is no surprise to me. I remember in those early days of writing that I mentioned more than once how I believed that life, in general, was much like a kaleidoscope – forever evolving and changing into something else. I still believe that today, and I still believe that those of us who are able to be flexible and change along with things are more likely to have an easier time surviving. It just makes sense to me. I also try to focus on the good and positive things here in my posts. While I realize that the world isn't full of lollipops and rainbows, I also believe that 'we follow where we focus' and that by concentrating on the positive and good aspects of our lives, it lessens the impact of the negative things. But that isn't always the easiest thing to do, is it? Things have been so difficult for so many these days. While I like to dwell on what I call my "Pink Cloud", there have been many days of late when I have found that difficult, if not impossible to do. It is hard to be cheerful and joyful when so many are suffering. It is also hard to write cheerful and carefree posts without feeling as if you are minimizing the suffering of others or your own concerns. Sometimes it is a fine line to walk. As a result, I have chosen to back off these past several months and take some time. I am grateful that I have been doing a great deal of 'busy work' in creating surfaces for decorative painters to paint on. While it has been overwhelming at times, more so than not it has kept me feeling positive and productive on days when I would otherwise despair. Those long, hard days in my shop where I have piles of wood to cut for orders have been my emotional salvation, as they help me focus on positive things such as how those who ordered them will use and enjoy the pieces and even how many of them will become family treasures. Having a part in that process was the ray of light that I have been able to hold on to on some of the darkest days. It has helped more than anyone can imagine. It has also caused me to refocus and re-prioritize what I was doing. 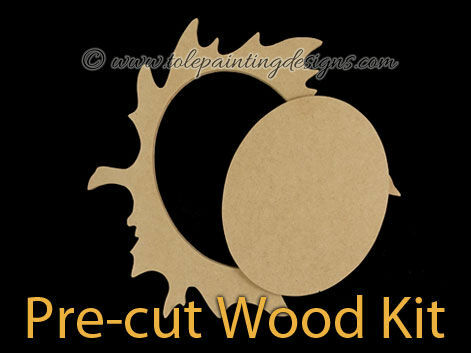 Our scrolling and woodworking customers seemed to have really looked to my partner Keith for his lovely word-art designs, and my painting followers have encouraged me not only to continue my own designs but also to expand the scope of surfaces that I offer. It has really lifted both Keith and me up these days, and we appreciate it very much. It has encouraged us to branch out even further and expand and grow our business more. We are grateful. I used all DecoArt Americana paints on the main design and their new Extreme Sheen Metallic Paint on the leaf frame. I love the new Extreme Sheen Metallics. They are probably the shiniest metallic paint that I have used. You can get them at the DecoArt site here (DecoArt Metallics Extreme Sheen) or at your favorite craft supplier. I thought it looked really nice on that. I think there are so many possibilities for this leaf surface! 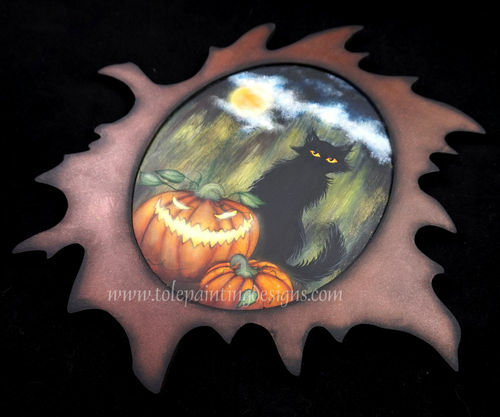 It will lend well to Halloween, Thanksgiving and autumn designs in general. I hope that everyone likes it. 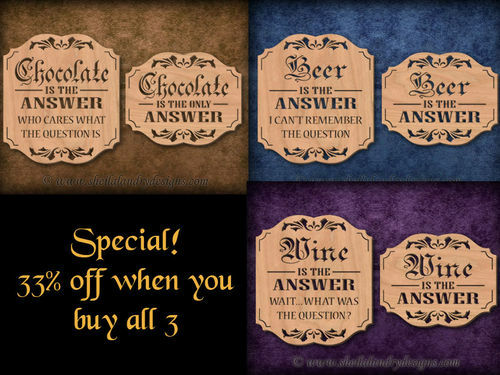 These fun designs are appropriate for many situations and are sure to be popular as gifts, at craft shows and sales, or to keep yourself. We hope you like them. 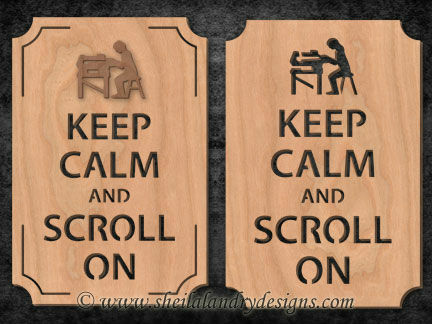 Keith made this nice pattern set (SLDK738 - Keep Calm and Scroll On) which includes both a male and female version, as well as fretwork or overlay figures. We hope that you enjoy this for your shop or the shop of someone you know loves to scroll. On a final note, I wanted you all to be aware that I am venturing into something else that is totally new for me. 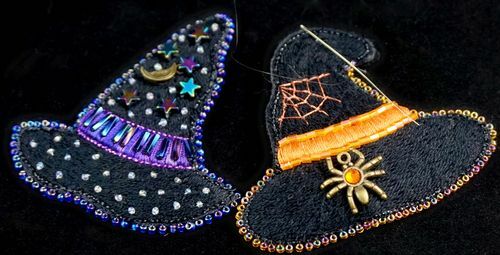 Since I have shown many of my embroidery pieces here on my blog and on social media, I frequently receive requests to offer kits of some of the things I have been making. I have considered this for over a year now, and have slowly and carefully done the homework, researched suppliers, and tried to think of every aspect of providing kits for my designs. I haven't said much about it except to close friends because it has taken quite a while to get things in order. But I am finally seeing the light at the end of the tunnel. After much planning, purchasing supplies, and thinking things through, I am ALMOST ready to offer embroidery kits to my customers. I am very excited about this, and I want them to be the best kits I can offer. In the past, I have purchased kits that were nice, but very 'incomplete'. This caused me to have to search out supplies and was quite a challenge. It was because of this that I saw a need for kits that had just about everything needed to make the project except scissors and a couple of truly 'common' household supplies. Each kit will contain the highest quality silk ribbons, glass beads, metal charms, silk, perle cotton and metallic threads, Ultrasuede backings, and even beautiful, high-quality needles. I have searched all over the world to obtain these supplies and have done all the 'leg work' so that it would be fun and easy to create using the best quality materials. Each kit will also include full, step-by-step instructions complete with color photos. I am very close to launching them and should be doing so in the next week or so. I didn't want to muddy up either the Sheila Landry Designs site or the Tole Painting Designs site, so I renamed and designated my Etsy Store for this venture. I now call my store "The Stitching Kitty" and it will be the home of all of these lovely kits. I will make a formal announcement when things are ready. So you see, I have been keeping pretty busy. With all the negative things going on these days, I find that bringing joy to others through sharing my love of creating is the best way I can cope with things. As always, Keith and I appreciate all of our followers and customers. So many of you have become real friends. We wish you all the best in whatever you do. We will be sending out our newsletter probably later today, so if you subscribe to it, look for it in your email. Thanks again to all of you for your support. We are both so grateful. Good morning to you, up early and curled up on the couch, hard to know what to say after reading your blog. Nice you enjoy your work,I just hope the repetitive work of cutting does not get you down, The creative part is great. Stimulating, The picture of the kit is super cute, of the baby sheep with the thread, your not planning of doing that are you. To much is to much, Simplify, And keep sane. and don’t take your signs literally because that would not be the answer. Too many have taken that road. I am always busy at home, but now I am in Oregon doing maintenance type work at a youth camp, I time to give, that helps with perspective too. Are the roses still blooming there, check them out. Good morning to you, Brian. It is good to hear from you. You and all those on the west coast have been on my mind. I worry about my friends. So many of them are in harm’s way. It is unsettling, to say the least. Sometimes ‘repetition’ is calming. I have recently had the epiphany of tuning into classical literature on my cordless headphones while I cut the hundreds of ornaments. You can’t imagine how much it makes it more pleasant and stimulating. I began with listening to “Catcher in the Rye”. I read it in high school and forgot most of it. As an adult, I wanted to see if it impacted me any differently than when I was 16. Looking at the same story through a different perspective was interesting. I loved it. I then ‘read’ one of my favorite stories – “The Great Gatsby”. I had plowed through about half of it years ago, but somehow got distracted. After seeing the movie only about two years ago, I went back to the original film of the story – the one with Redford as Gatsby. But still – the book was much deeper and more descriptive, as books tend to be. I find it to be an excellent story that is perhaps coming full circle in regards to many issues of today. I don’t know why it impacted me as much as it did. I just loved it. Now I am on The Adventures of Huck Finn. I am about halfway through listening to that. It is another case of not really paying attention as a youngster, yet catching and appreciating the sarcasm and humor of Twain as an adult. I like this audio book venue. I see many hours of pleasure while I am being productive. I have always loved reading, but lately, just haven’t had the time. As far as the Stitching Kitty shop – it will be a fun and exciting new avenue for me. The sheep bowl and Baa-bins are my own creation of a couple of years ago. I made the pattern and had so many requests for the finished product(s), I put them in the Etsy shop. I have sold countless sets of them, and they are fun to make and people seem to adore them. The orange hat isn’t quite complete yet. I also have another one in the works, but I will show that later on. I am starting small and working my way up to larger pieces if these are successful. It is something I enjoy doing in the evenings to wind down, and as I said I have been asked countless times to make them to kits. We will see how they do. 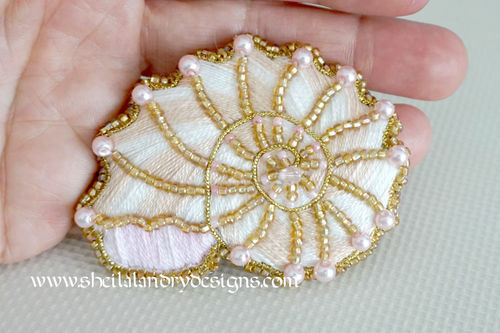 When I showed the shell half done, a shop in BC offered to wholesale my kits when I am ready. I was very encouraged. So you see – my time off has been spent “thinking”. ;) It keeps my mind occupied so I don’t worry about things that I can’t control. Staying in my own world sometimes helps me through the tough one we live in. Sharing what I do helps heal me. Take care, my friend. Stay safe. Sheila, you are a great inspiration the way you can keep moving forward, seeing a creative need and filling the void. You are so right that most kits do not include everything that you need. I have no doubt that this will be as equally successful as the scroll sawing and painting are. Keith’s new designs are great. Hi, Anna. Thanks as always for stopping by. I don’t know where I would be without my creative people and friends. 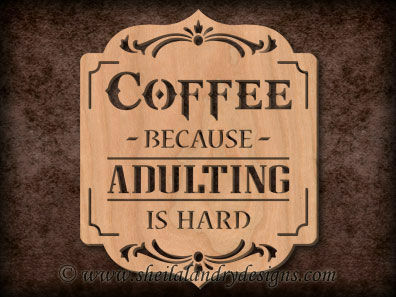 It really does help give my life purpose. I hope you are still getting warm weather and out of harm’s way with the fires. It is terrible how many are suffering from things these days. It is hard not to feel overwhelmed.